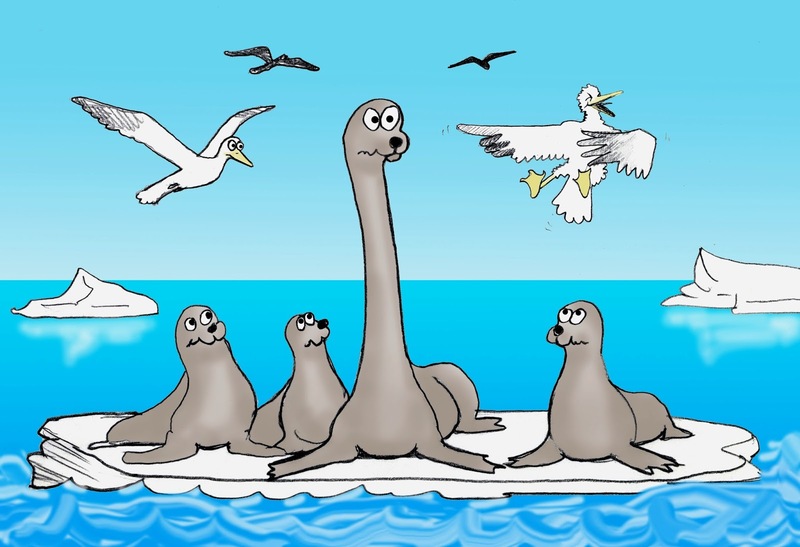 In Part 1 of this ShukerNature blog article (click here), I investigated the candidature of an undiscovered species of giant long-necked seal as an identity for certain sea serpents, as promoted in particular by Drs Anthonie Oudemans and Bernard Heuvelmans. However, the concept of such a creature is not confined to the contemplation of marine cryptids, as now revealed. 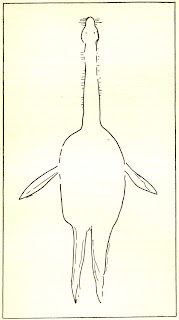 Heuvelmans believed that it was his hypothesised long-necked seal, which he had formulated and dubbed Megalotaria longicollis in his seminal book Le Grand Serpent-de-Mer (1965), rather than any postulated form of surviving plesiosaur that was responsible for those water monsters yielding the now-iconic, vertically-held, periscope-like head-and-neck image firmly planted in everyone's mind when picturing water monsters (and most especially the Loch Ness monster), whether marine or freshwater in habitat, though in his book he confined himself to those cryptids on record from the seas and oceans. 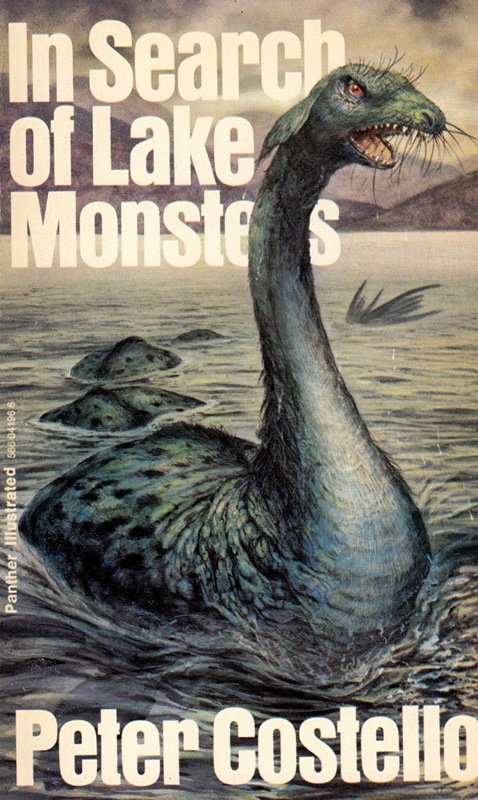 Published in 1974, Costello's book was entitled In Search of Lake Monsters, and in this global study he followed much the same course as Heuvelmans did in his own, i.e. 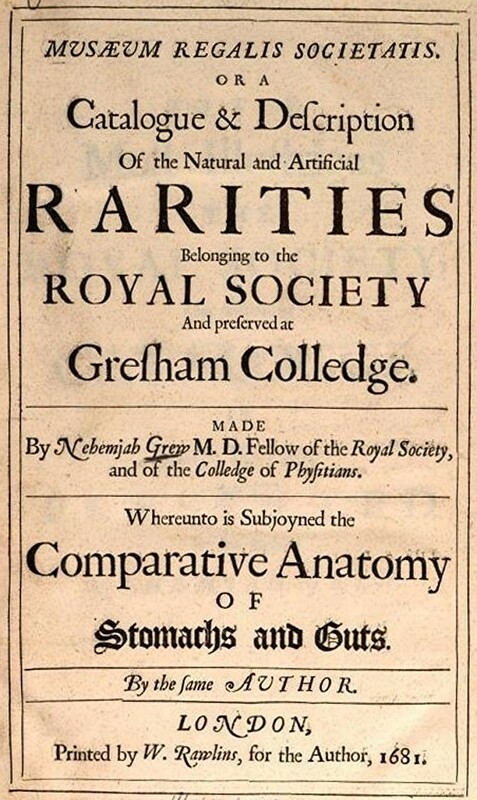 analysing an extensive collection of eyewitness reports of aquatic cryptids from around the world (but freshwater in this instance, with particular emphasis upon Scottish loch monsters), and then providing what he considered to be the most likely identification for them. Here, however, he diverged markedly from Heuvelmans, pursuing the Oudemans approach instead. 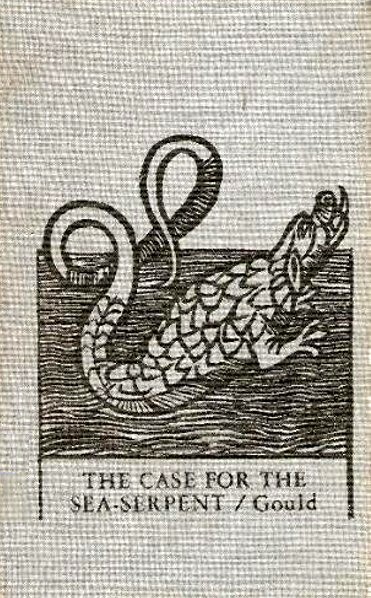 For whereas Heuvelmans had proffered a series of no less than nine different hypothetical cryptids as the collective solution to the sea serpent mystery, Costello bravely put forward only a single identity to explain virtually all of the lake monsters documented by him (including Nessie), diverse though they seemed to be in form, and therefore potentially inviting criticism of the kind that Oudemans's Megophias had attracted, i.e. that his solution was of the 'one-size-fits-all' variety – but that was not all. 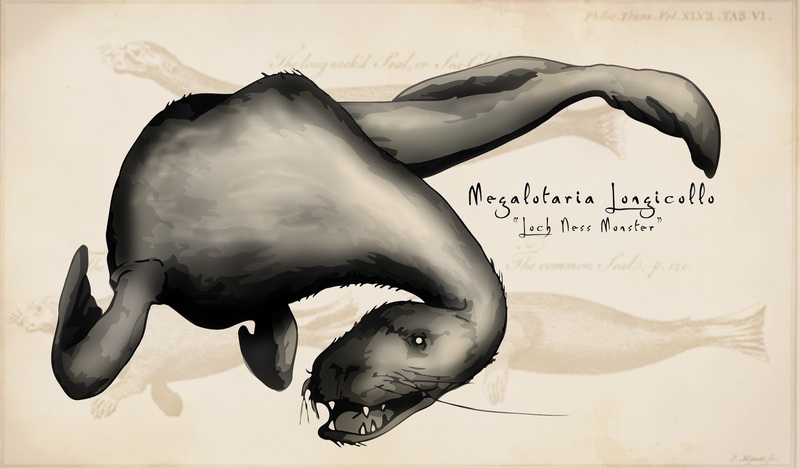 The single identity that he proposed was none other than Heuvelmans's very own giant long-necked seal, Megalotaria longicollis, thereby deeming it to be capable of living in freshwater habitats as well as in marine environments. 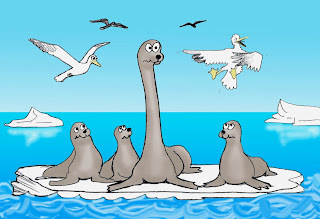 As expected, therefore, for the most part Costello's description of this giant long-necked seal reiterated that of Heuvelmans for the same hypothetical species. 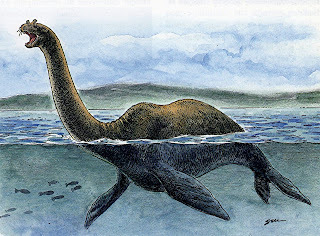 However, he did also provide a few additional details, especially when specifically relevant to its inhabiting a freshwater domain, such as the assertion (rather than merely a speculation as offered by Heuvelmans for maritime Megalotaria) that it hunts by sonar, especially in stygian bodies of water like Loch Ness where vision is rendered largely or entirely superfluous, and that its hearing is therefore exceptionally sharp. As noted in Part 1 of this ShukerNature article, however, currently there is no conclusive evidence that pinnipeds do use sonar. He also claimed that it gives vent to a sharp staccato cry that sounds like a sea-lion's bark. According to Costello, therefore, Nessie is merely a lake-dwelling long-necked seal, a freshwater-confined representative of Heuvelmans's marine Megalotaria, not even sufficiently distinct, despite its different habitat, to warrant any taxonomic delineation from the latter creature. Yet if this were true, why have other maritime pinnipeds only rarely or never established exclusively freshwater intraspecific populations? The only notable examples are two totally freshwater subspecies of the ringed seal Pusa (=Phoca) hispida – namely the greatly-endangered Saimaa seal P. h. saimensis (confined entirely to Finland's Lake Saimaa) and the Ladoga seal P. h. ladogensis (confined entirely to Russia's Lake Ladoga) – and some non-taxonomically discrete colonies of the common seal Phoca vitulina in a few lakes, such as Alaska's Lake Iliamna (already well-known to monster seekers for the giant fishes that allegedly inhabits its voluminous waters) and certain lakes in Quebec (a few researchers do elevate these Canadian individuals to the rank of a valid subspecies of common seal, known as the Ungava seal P. v. mellonae). 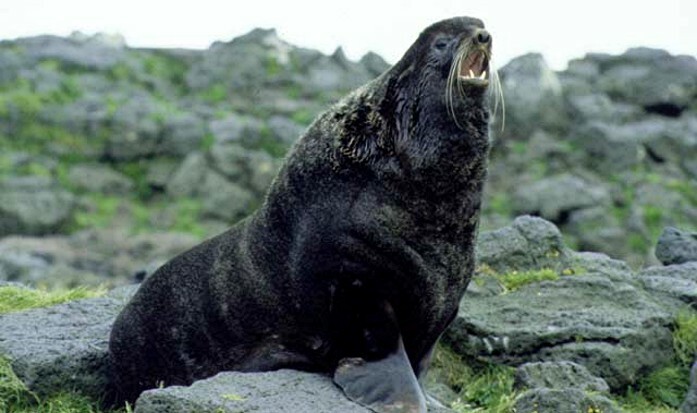 For the most part and with the vast majority of pinniped species (particularly the bigger ones), however, colonisation of freshwater simply does not occur. Yet it's not as if they never find their way inland from the sea – on the contrary, every year there are confirmed reports of seals in various rivers across the UK, for instance, and there are even verified records of specimens of known seal species in Loch Ness itself. However, whereas these have not led to the establishment of landlocked freshwater seal colonies (despite being much smaller than Megalotaria and therefore enabling a given volume and prey content of freshwater to accommodate and sustain more specimens of these seals than would be the case with a giant long-necked seal), according to the freshwater long-necked seal hypothesis the marine Megalotaria has somehow managed to accomplish this feat in numerous lakes all across the world. But how could this particular pinniped species (always assuming that it does exist, of course!) have been so markedly successful at freshwater colonisation on an international scale, which would surely have involved some very visible migrations into freshwater at the onset, while also being so extraordinarily (indeed, inexplicably) adept at eluding all attempts by scientists and laymen alike to confirm its reality that not so much as a single skull or skeleton has ever come to scientific attention anywhere across its entire global distribution? It is just about within the realms of possibility that amid the vastness of the world's seas and oceans the maritime Megalotaria can still evade scientific detection even in modern times, but how can its freshwater counterparts do the same, even when their lakes occur in close proximity to human habitation? For me the concept of Megalotaria, whether in the seas or (especially) in freshwater lakes, remains a particularly thorny one both to grasp and to retain. Much less familiar a cryptid than the longneck sea serpent (and its freshwater equivalents) is a second aquatic mystery beast whose identity may be that of a still-undiscovered species of long-necked seal. The Bering Sea separates Alaska from Far East Russia, and contains a number of islands, which have been and, in some cases, still are inhabited by members of the Inuit nation. According to their traditional lore, the seas around at least two of these islands are home to a very mysterious, and allegedly highly dangerous, marine creature known as the tizheruk to the Inuits that once lived on tiny King Island (the entire population had resettled on the Alaskan mainland by 1970), and as the pal rai yuk to those still living on the much larger Nunivak Island. In his book Searching For Hidden Animals (1980), pioneering American cryptozoologist Dr Roy P. Mackal (until his retirement working in an official capacity as a biochemist at the University of Chicago) noted that the Inuits originally inhabiting King Island had provided a detailed account of the greatly-feared tizheruk to ethnologist Dr John White, formerly of Chicago's Field Museum of Natural History. Based upon this information, which he shared with Mackal, White revealed that only the tizheruk's head and neck are usually observed, which rear 7-8 ft out of the water. The head is snake-like in appearance, and on the rare occasions when the tail is visible it can be seen to bear a flipper at its end. These animals are generally encountered in the bay areas, less frequently in the open sea, and by placing their ears against the inside of their boats the Inuits can hear them coming up for air. Moreover, if they tap against their boats, the sound often attracts these animals, their curiosity bringing them closer as they seek to discover the tapping noise's nature – not that the Inuits make a point of attracting tizheruks, however, because they claim that these creatures will actively attack humans, and they recounted numerous episodes to White in which hunters had reputedly been killed by them. Mackal considered that the tizheruk was most probably a scientifically-unknown species of long-necked seal, and went on to suggest a more specific identity for it that is extremely thought-provoking. Namely, a currently-undiscovered northern counterpart of the Antarctic's (in)famously aggressive leopard seal Hydrurga leptonyx (aka the sea leopard). Generally up to 12 ft long, weighing as much as 1300 lb, named after its throat's spotting, possessing a visibly elongate neck (especially when striking prey or stretching it to look at something – click here to view a very famous and truly spectacular example of its neck-elongating behaviour), and belonging to the phocid (earless) family of seals, this formidable beast is the second largest seal species indigenous to the Antarctic – only the southern elephant seal Mirounga leonina is bigger. It is also voraciously carnivorous, second only to the killer whale as the Antarctic's top predator, preying upon creatures as large as fur seals and emperor penguins. 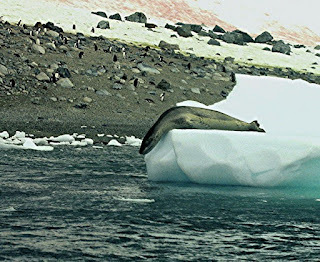 Moreover, those cryptozoologists favouring a reptilian rather than any mammalian identity for long-necked marine cryptids can take at least a crumb of comfort from the fact that, as commented upon by many scientists and laymen alike over the years, the leopard seal is startlingly reptilian in superficial morphological appearance. This is especially true when seen on land, across which it can move at a remarkable speed, albeit by vertical wriggling (a mammalian trait) rather than horizontally (which is how reptiles typically, though not invariably, undulate). And when it moves the resemblance [to a snake] is heightened for, unlike every other sort of seal, it holds the foreflippers closely pressed to the body and makes no use of them to help itself along – it wriggles with an up-and-down looping movement, pressing the chest and the pelvic region to the ground alternately. Returning from a hunting trip, Orde-Lees, travelling on skis across the rotting surface of the ice, had just about reached camp when an evil, knob like head burst out of the water just in front of him. He turned and fled, pushing as hard as he could with his ski poles and shouting for Wild to bring his rifle. The animal – a sea leopard – sprang out of the water and came after him, bounding across the ice with the peculiar rocking-horse gait of a seal on land. The beast looked like a small dinosaur, with a long, serpentine neck. After a half-dozen leaps, the sea leopard had almost caught up with Orde-Lees when it unaccountably wheeled and plunged again into the water. By then. Orde-Lees had nearly reached the opposite side of the floe; he was about to cross to safe ice when the sea leopard's head exploded out of the water directly ahead of him. The animal had tracked his shadow across the ice. It made a savage lunge for Orde-Lees with its mouth open, revealing an enormous array of saw like teeth. Orde-Lees' shouts for help rose to screams and he turned and raced away from his attacker. The animal leaped out of the water again in pursuit just as Wild arrived with his rifle. The sea leopard spotted Wild, and turned to attack him. Wild dropped to one knee and fired again and again at the onrushing beast. It was less than 30 feet away when it finally dropped. Two dog teams were required to bring the carcass into camp. It measured 12 feet long, and they estimated its weight at about 1,100 pounds…The sea leopard's jawbone, which measured nearly 9 inches across, was given to Orde-Lees as a souvenir of his encounter. In his diary that night, [fellow expedition member Frank] Worsley observed: "A man on foot in soft, deep snow and unarmed would not have a chance against such an animal as they almost bound along with a rearing, undulating motion at least five miles an hour. They attack without provocation, looking on man as a penguin or seal" . 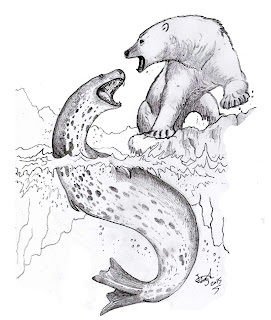 If, as postulated by Mackal, a creature comparable in form and ferocity to the leopard seal existed in the Bering Strait, it would certainly make a plausible identity for the tizheruk. Many a time when I have been fishing with the pram moored to the floating kelp I have brought a leopard [seal] right alongside by playing on its curiosity – if you tap gently and regularly with a rowlock on the gunwale or thwart you very soon find any leopard that may be near swimming alongside and looking up into your face. Needless to say, this instantly recalls the identical activity carried out by the Inuits and the identical response to it given by the tizheruk. Concluding his book's tizheruk coverage, Mackal speculated that this cryptid may resemble an enlarged version of the leopard seal in general appearance, but more specialised in that it either lacks forelimbs completely (as the Inuits seem not to mention them in their lore relating to it), or possesses reduced versions that it keeps folded tightly against its body when seen out of the water (just as the leopard seal does), rendering them virtually invisible and thus enhancing its superficially serpentine appearance. 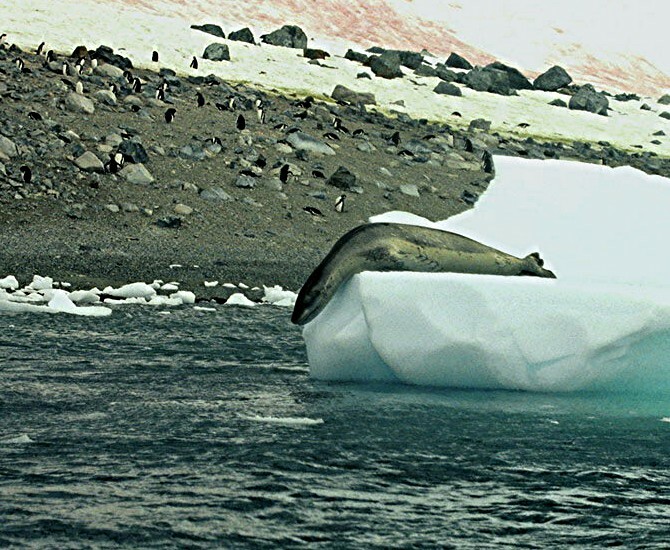 Most southern hemisphere seals have a northern hemisphere counterpart of sorts, thereby making the leopard seal a noteworthy exception – unless its northern hemisphere counterpart is simply awaiting formal discovery, meanwhile living in scientific anonymity amid the chilling waters around certain islands in the Bering Sea? 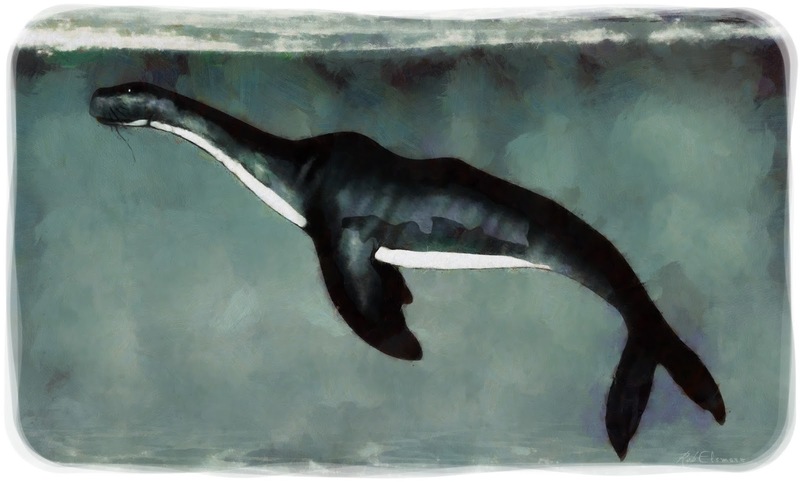 As noted at the beginning of Part 1 of this ShukerNature blog article, whereas plesiosaurs do at least have a fossil record substantiating their erstwhile existence, there is no evidence whatsoever in the currently-known fossil record for the existence at any time in pinniped history of an extreme, veritable giraffe-necked form like Megalotaria as predicted by Heuvelmans et al. as the identity of aquatic longnecks. Indeed, the only confirmed evidence for the former existence of any seals possessing necks that were in any way longer than those of modern-day species is the series of fossil remains from the so-called swan-necked seals belonging to the extinct phocid genus Acrophoca. But just how long were their necks, and were they long enough to justify their popular 'swan-necked' tag? Dating from the late Miocene to early Pliocene (approximately 7-4 million years ago), the first species to be discovered and named was Acrophoca longirostris, which was formally described by palaeontologist Dr Christian de Muizon in 1981, and whose fossils have been uncovered in Chile and Peru. It measured up to 5 ft in total length, and in Muizon's description he revealed that both the length of its cervical vertebrae and the total length of its cervical column exceeded those of all modern-day seals. Moreover, its cervical column length was approximately 21% of its total vertebral column length, whereas in modern-day seals it is generally 17-19%. Its skull was also noticeably lengthy (hence its species name, longirostris). 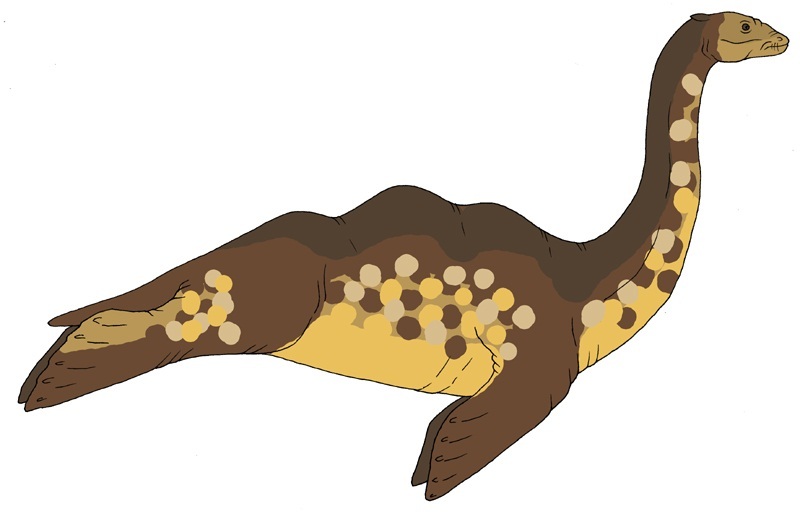 Yet although the neck of A. longirostris was proportionately longer, it was not as streamlined as the neck of what may well be its closest modern-day relative – the leopard seal. 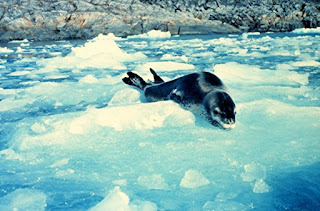 Moreover, its flippers were less well-developed, a second characteristic indicating that it was less adapted for swimming than the leopard seal, and that it may therefore have spent much of its time around the Pacific's coasts rather than out at sea (a behavioural preference that, if true, has been perpetuated by the leopard seal, in spite of its more specialised form for swimming). …when alive, Acrophoca would have been capable of looking even longer in the neck than we might think just from its fossils. But clearly it’s a stretch [pun intended?!] to imagine this animal as having a long long long neck like a swan, or a plesiosaur, so, sadly, ‘swan-necked seal’ really is a bit of an exaggeration. In 2002, with fellow palaeontologist Dr Stig A. Walsh, Naish co-described what appeared to be a new, second Acrophoca species, based upon fossils retrieved in Chile, but they declined to give it a formal scientific name. This was because substantial new fossil material hailing from Peru suggested the presence of several additional Acrophoca species, so it was felt best to await their full description first. Interestingly, one of these new species had an even longer skull than A. longirostris, so it may have looked more unusual than the latter. Ironically, however, we do not even have to look back into prehistory to uncover bona fide, fully-verified long-necked seals. So far, this two-part article has been assessing attempts by various cryptozoologists down through the ages to propose as the identity of longneck aquatic cryptids the existence of a highly-specialised species of seal whose defining characteristic is its long neck. In reality, however, what is not readily realised is that science has already confirmed the existence of several such species – species, moreover, which are actually alive today. But how can this be? Allow me to explain. With the notable exception of the leopard seal's well-delineated neck, in most modern-day seal species the neck is largely hidden, often concealed by blubber, to the point of seeming to be all but non-existent in certain forms. A close examination of such species' skeletons, conversely, reveals a very different – and extremely surprising – picture. 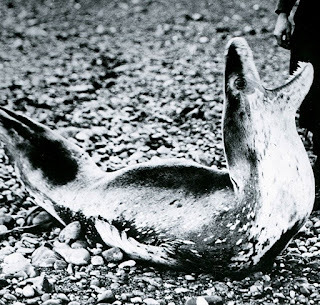 On 15 March 2013, American biologist Cameron A. McCormick's blog Biological Marginalia posted a fascinating article entitled 'The hidden necks of seals', containing a table of measurements obtained from a range of different pinniped species. For each species, the length of its neck was given as a percentage of the combined length of its thoracic and lumbar (T-L) vertebrae, and the results were quite remarkable to read. 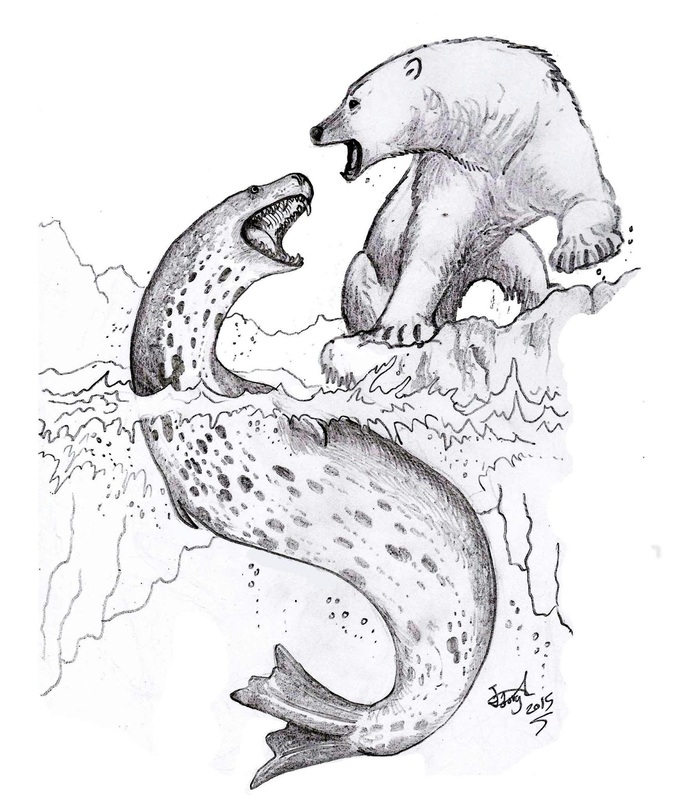 Using this comparison, the bearded seal Erignathus barbatus had the shortest neck among phocids, at only 21% T-L, whereas the harp seal Pagophilus groenlandicus boasted the longest neck, at 35% T-L – exceeding even the leopard seal's 29% T-L. As for otariids, the shortest neck was that of the Australian sea-lion Neophoca cinerea at 34.5% T-L, and the longest was that of the northern fur seal Callorhinus ursinus at 41% T-L. But what was most significant was that even the shortest necks were actually much longer than they outwardly appeared to be in the living animal. So in a very real sense, some already-known, modern-day seal species are actually cryptic long-necked seals, or, to be precise, hidden-neck long-necked seals. In view of this unexpected revelation, one can scarcely even begin to guess at what the neck percentage T-L value might be for a giraffe-necked, Megalotaria-type of long-necked seal – especially when we take into account (judging at least from the above data) that there may be an additional neck portion hidden from sight beneath blubber at its basal region. In fact, such an exceptionally long neck could well be of truly plesiosaurian proportions! Prior to the establishment of the Journal of Cryptozoology in 2012, the appearance in a peer-reviewed academic journal of a paper dealing with cryptids was probably just as rare as the beasts documented in it. 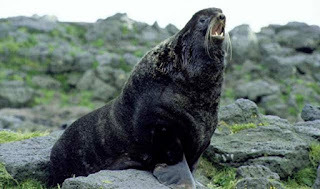 This is why, back in late 2008 (and in June 2009 online), the publication by the mainstream scientific journal Historical Biology of a paper contemplating the possible existence of still-undiscovered pinniped species was of particular note – and, one hopes, an indication of increasing mainstream approval for serious cryptozoological research. 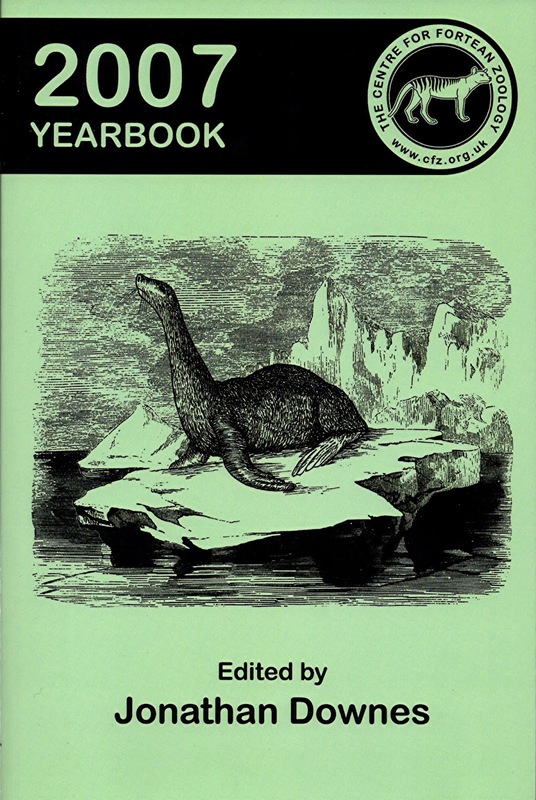 Authored by Drs Darren Naish and Michael A. Woodley (the latter being a Royal Holloway, University of London postgraduate biology student at that time), both with well known cryptozoological interests, together with Royal Holloway computer scientist Dr Hugh P. Shanahan, it was entitled ‘How many extant pinniped species remain to be described?’. 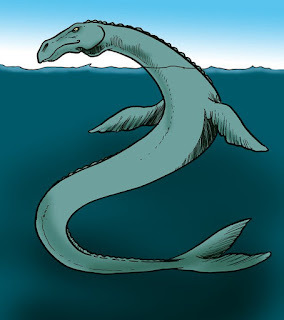 In it, the authors examined the description record of the pinnipeds using non-linear and logistic regression models in an attempt to ascertain the number of still-undescribed species, and they combined that work with an evaluation of cryptozoological data, featuring such alleged pinniped cryptids as the longneck sea serpent, the merhorse, Vancouver’s serpentiform Cadborosaurus, and the tizheruk. From the results obtained, they revealed that three possibly new, currently undescribed species of pinniped match their statistical expectations, but even these, the authors felt, would need to possess some exceptional characteristics if they do indeed exist. A giraffe-proportioned neck combined with huge body size would certainly be exceptional, but for all the reasons presented and assessed in this two-part article, it seems to me at least that these would be highly improbable characteristics for a seal species to possess and yet remain undiscovered by science, especially if it did indeed occur in both marine and freshwater habitats. Consequently, I am not expecting to witness the formal scientific discovery of a Megalotaria-type pinniped any day soon – but how I would love to be proved wrong! 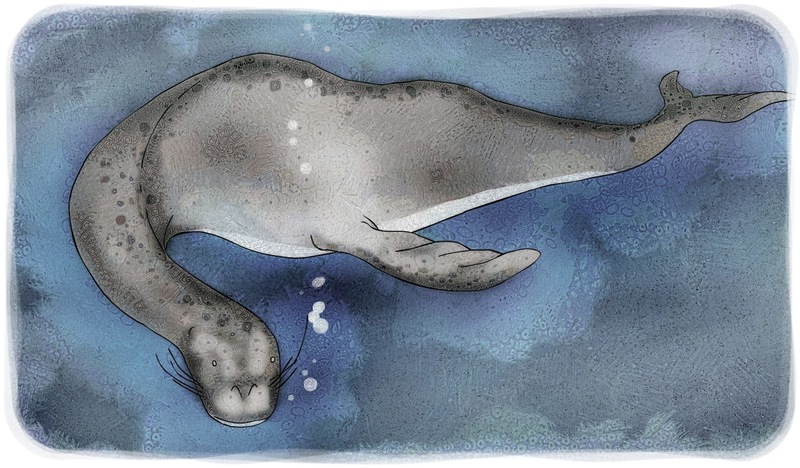 As readers of this article will no doubt have realised by now, I am definitely not a proponent of the giraffe-necked, Megalotaria-type giant seal as an identity for any aquatic cryptid. Consequently, I would like nothing more than to jettison it as far away from my thoughts as possible when reviewing such creatures, but there is one tantalising case that always prevents me from doing so – and this is it. The Orkney Islands and Caithness on the mainland of northern Scotland are separated by a strait of seawater known as the Pentland Firth, which is a popular habitat for seals throughout the year. Two species are known to occur here, the common seal and the grey seal Halichoerus grypus – but at about 9.30 am on or around 5 August 1919, off the Orkney island of Hoy, what seems to have been a third, and dramatically different, seal species also made an appearance in this strait, to the astonishment of its eyewitnesses. These consisted of a holidaying lawyer named J. Mackintosh Bell and some local cod fishermen friends of his whom he had chosen to work with on their boat while visiting the Orkneys. His friends had seen the creature before, were very perplexed as to what it might be, and had actually just begun to tell him about it in the hope that he may be able to identify what it was when the subject of their conversation abruptly appeared, not far away from the boat that they were in. Lieutenant-Commander Rupert T. Gould of Britain's Royal Navy investigated and documented aquatic monsters in his spare time, and after learning about this sighting he contacted Bell and asked him for full details. Bell duly forwarded an in-depth account, which Gould later published in slightly abbreviated form within his book The Case For the Sea-Serpent (1930). 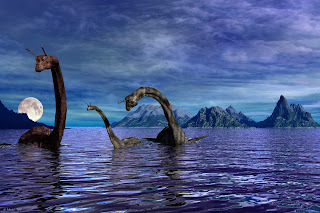 Four years later, moreover, Gould wrote the first comprehensive study of Nessie, entitled The Loch Ness Monster and Others, spending several days at the loch, travelling around it on his motorbike, and interviewing many eyewitnesses during his researches for this book. The very first day I was there, I think it was about 5 August, I went afloat with a crew of four at about 9.30 a.m. for the purpose of firstly lifting lobster creels and then for cod fishing. On making our way to the creels, which had been set in a line between Brims Ness and Tor Ness, my friends said "We wonder if we will see that sea monster which we often see, and perhaps you will be able to tell us what it is." We got to the creels, hauled some, and were moving slowly with the motor to another, when my friends said very quietly "There he is." I looked, and sure enough about 25—30 yards from the boat a long neck as thick as an elephant's fore leg, all rough-looking like an elephant's hide, was sticking up. On top of this was the head which was much smaller in proportion, but of same colour. The head was like that of a dog, coming sharp to the nose. The eye was black and small, and the whiskers were black. The neck, I should say, stuck about 5-6 ft., possibly more, out of the water. The animal was very shy, and kept pushing its head up then pulling it down, but never going quite out of sight. The body I could not then see. Then it dis­appeared, and I said "If it comes again I'll take a snapshot of it." Sure enough it did come and I took as I thought a snap of it, but on looking at the camera shutter, I found it had not closed owing to its being swollen, so I did not get a photo. I then said "I'll shoot it" (with my .303 rifle) but the skipper would not hear of it in case I wounded it, and it might attack us. It disappeared, and as was its custom swam close alongside the boat about 10 feet down. We all saw it plainly, my friends remarking that they had seen it many times swimming just the same way after it had shown itself on the surface. My friends told me that they had seen it the year before just about the same place. It was a common occurrence, so they said. 'That year (1919) was the last of several years in which they saw it annually. It did not show itself again for two or three years, and then it was only seen once. As to its body, it was, seen below the water, dark brown, getting slightly lighter as it got to the outer edge, then at the edge appeared to be almost grey. It had two paddles or fins on its sides and two at its stern. My friends thought it would weigh 2 or 3 tons, some thinking 4 to 6. Not only my friends, but others, lobster fishing, got many chances of seeing it. . . I may say that since 1919 all cod and other deep-sea coarse fish have left the Pentland Firth. I think the reason is that such monsters frequent the rocky caves, which are always covered by deep water. My friends think the animal may have been killed by a passing steamer, but I think it is possibly a native of warmer seas, and that if we get a really hot summer it will be seen again. 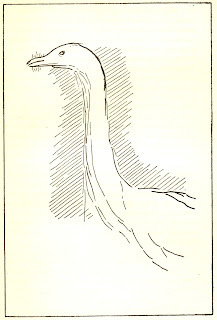 Bell also furnished Gould with two sketches that he had drawn of the animal, one showing how it looked when swimming underwater, plus a map of the approximate location where they had seen it. This was on the northern side of the Pentland Firth, roughly 1.6 miles north-westward of Tor Ness, the southern point of the Orkney island of Hoy, and about an eighth of a mile offshore, in some 20 fathoms of water.
. . . Dimensions. Neck, so far as seen, say 6—7 feet. Body never seen when neck straight up, but just covered by the water. You could detect the paddles causing the water to ripple. When under water, swimming, the body, I think, to the end of the tail flappers would be about 12 ft. long - and, if the neck were stretched to say 8ft., the neck and body 18—20 ft. long. The skipper of the boat remarked that sometimes the top of the head, when seen from a boat vertically, was a bright red. Neck thickness say 1 foot diameter : Head very like a black retriever — say 6" long by 4" broad. Whiskers black and short. Circumference of body say 10-11 feet, but this I am not sure of, as I never saw all round it, but it would be 4-5 ft. across the back. . .
Needless to say, everything about this creature, both in Bell's verbal accounts and in his sketches, screams out "Seal!!" – very long neck notwithstanding. When documenting it in his 2007 review of the long-necked seal concept, Robert Cornes stated: "If this account is true and there appears no reason to think otherwise, then it is arguably the most convincing for the existence of a seal with a long neck". Indeed it is, because if Bell's testimony and sketches are accurate, it is difficult to comprehend how the creature that he and his friends saw could have been anything other than a seal – and an exceptionally, extraordinarily long-necked one at that. It is for this reason, if for no other, that the concept of the long-necked seal, even in its most bizarre, giraffe-necked manifestation, continues to frustrate and fascinate me in equal measure, and seems destined to do so for a long time to come. 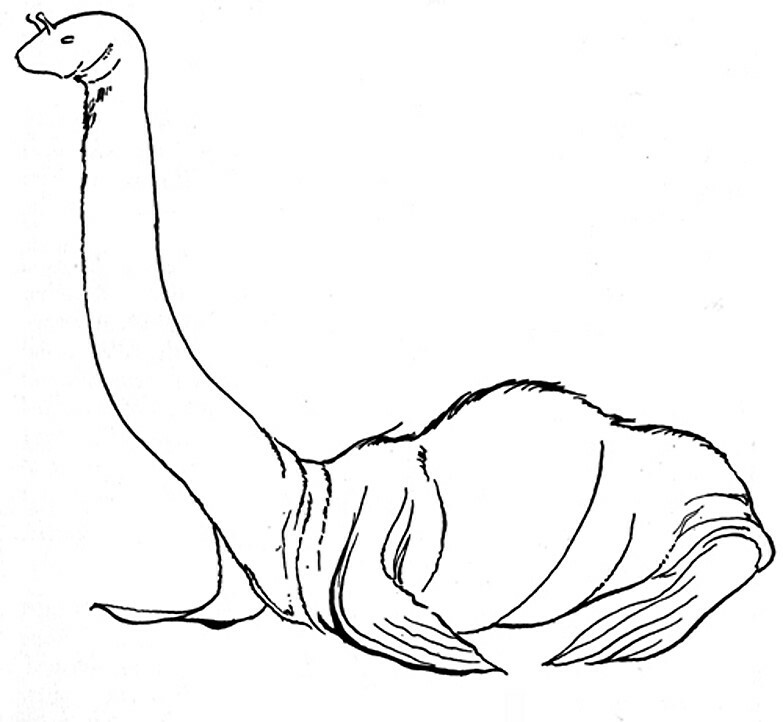 This ShukerNature blog article is excerpted from my forthcoming book, Here's Nessie! 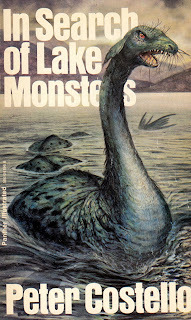 : A Monstrous Compendium from Loch Ness. CHAMPAGNE, Bruce A. (2007). A classification system for large, unidentified marine animals based on the examinations of reported observations. In: HEINSELMAN, Craig (Ed. ), Elementum Bestia: Being an Examination of Unknown Animals of the Air, Earth, Fire and Water. Crypto (Peterborough), pp. 144-172. COLEMAN, Loren and HUYGHE, Patrick (2003). The Field Guide to Lake Monsters, Sea Serpents, and Other Mystery Denizens of the Deep. Tarcher/Penguin (New York). CORNES, Robert (2007). The seal serpent: the case for the surreal seal. In: DOWNES, Jonathan (Ed. ), CFZ 2007 Yearbook (CFZ Press: Bideford), pp. 83-199. COSTELLO, Peter (1974). In Search of Lake Monsters. Garnstone Press (London). GOULD, R[upert].T. (1930). The Case For the Sea=Serpent. Philip Allan (London). GREW, Nehemiah (1681). 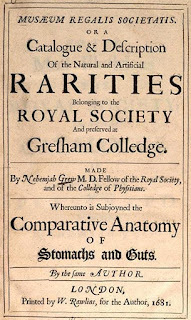 Musaeum Regalis Societatis: Or a Catalogue and Description of the Natural and Artificial Rarities Belonging to the Royal Society and Preserved at Gresham Colledge [sic]. W. Rawlins (London). HEUVELMANS, Bernard (1965). 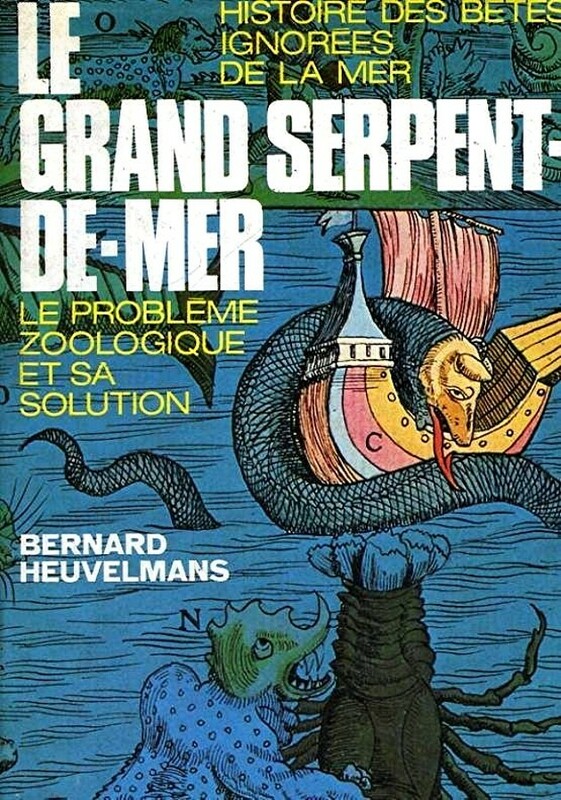 Le Grand Serpent-de-Mer. Plon (Paris). HEUVELMANS, Bernard (1968). In the Wake of the Sea-Serpents. Rupert Hart-Davis (London). LANSING, Alfred (1959). Endurance: The True Story of Shackleton's Incredible Voyage to the Antarctic. Hodder and Stoughton (London). MACKAL, Roy P. (1980). Searching For Hidden Animals: An Inquiry Into Zoological Mysteries. Doubleday (Garden City). MAGIN, Ulrich (1996). St George without a dragon: Bernard Heuvelmans and the sea serpent. Fortean Studies, 3: 223-234. MARDIS, Scott (1996). 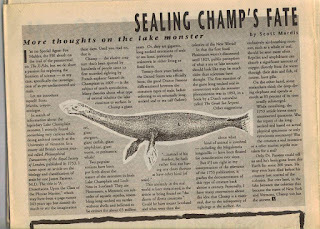 Sealing Champ's fate: more thoughts on the lake monster. Vox, 2 (No. 25; 7 August): 7. MATTHEWS, L. Harrison (1952). Sea Elephant: The Life and Death of the Elephant Seal. MacGibbon and Kee (London). McCORMICK, Cameron A. (2013). The hidden necks of seals. 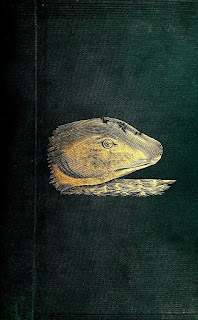 Biological Marginalia, https://biologicalmarginalia.wordpress.com/2013/03/15/the-hidden-necks-of-seals/ 15 March. MUIZON, Christian de (1981). Les vertébrés fossiles de la formation Pisco (Pérou). Première partie: deux nouveaux Monachinae (Phocidae, Mammalia) du Pliocene de Sud-Sacaco. Travaux de l’Insitut Français d’Études Andines, 22: 1-161. NAISH, Darren (2001). 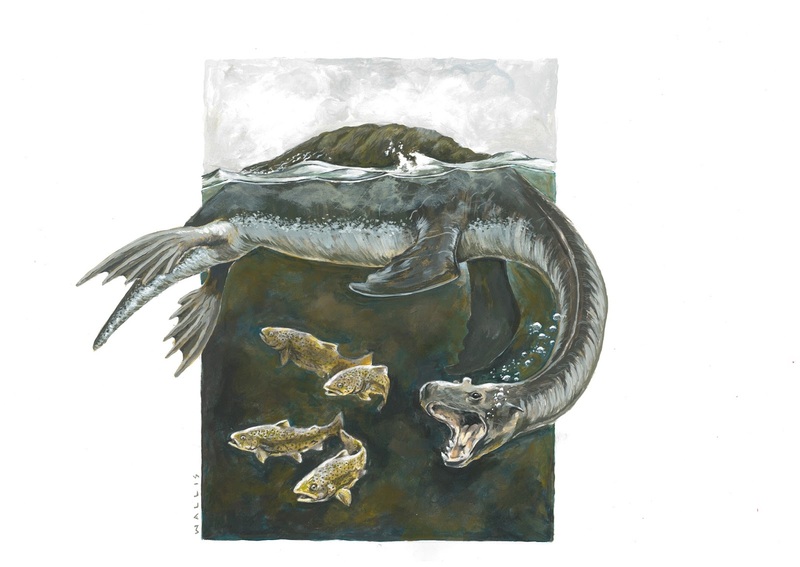 Sea serpents, seals and coelacanths: an attempt at a holistic approach to the identity of large aquatic cryptids. Fortean Studies, 7: 75-94. NAISH, Darren (2006). Swan-necked seals. 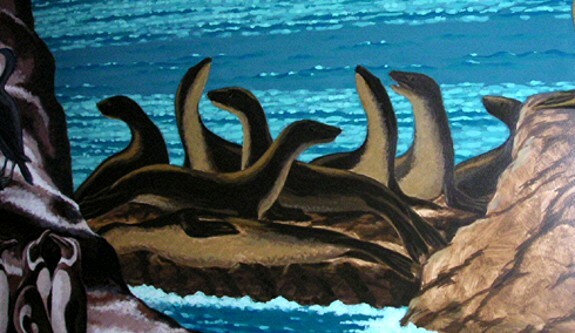 Tetrapod Zoology, http://darrennaish.blogspot.co.uk/2006/02/swan-necked-seals.html 4 February. OUDEMANS, Anthonie C. (1892). 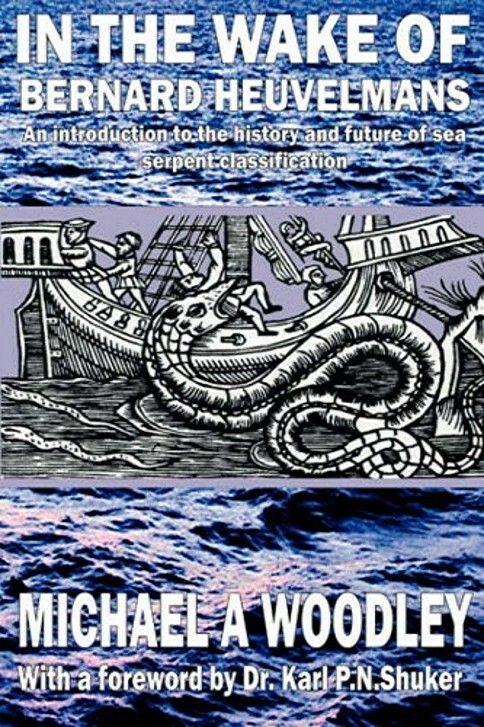 The Great Sea-Serpent: An Historical and Critical Treatise. E.J. Brill (Leiden). PARSONS, James (1751). A dissertation upon the class of the Phocae Marinae. Philosophical Transactions, 47: 109-122. SHUKER, Karl P.N. (1995). In Search of Prehistoric Survivors. Blandford (London). TAYLOR, Michael P.; WEDEL, Mathew J.; and NAISH, Darren (2009). Head and neck posture in sauropod dinosaurs inferred from extant animals. Acta Palaeontologica Polonica, 54(2): 213-220. WALSH, Stig A. and NAISH, Darren (2002). Fossil seals from late Neogene deposits in South America: a new pinniped (Carnivora, Mammalia) assemblage from Chile. Palaeontology, 45: 821-842. WOODLEY, Michael A. (2008). In the Wake of Bernard Heuvelmans. CFZ Press (Bideford). WOODLEY, Michael A; NAISH, Darren; and SHANAHAN, Hugh P. (2008) . How many extant pinniped species remain to be described? Historical Biology, 20(4): 225-235. 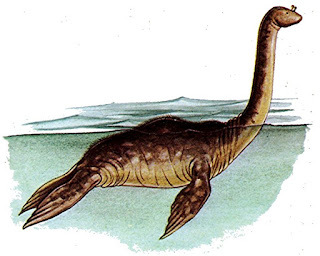 Although many mainstream palaeontologists may shudder at the merest thought of it, the Loch Ness monster's most readily-conceived public image will always be that of a typical plesiosaur – all neck, tail, and paddled limbs. Lurking in its shadow, never too far from scientific consciousness but a million miles away from popular recognition, however, is a second cervically-endowed yet very different identity candidate – the long-necked seal. Yet whereas the plesiosaur's at least erstwhile reality is unequivocally validated by the fossil record (albeit one in which this reptilian lineage is currently curtailed at a point over 60 million years ago), tangible evidence for the existence at any point in our planet's history of the kind of veritable giraffe-necked pinniped required to satisfy a mammalian identity for Nessie and other comparable 'periscope-profile' aquatic cryptids is conspicuous only by its absence. Indeed, to all intent and purpose there is no more proof for the reality of the long-necked seal than there is for the Loch Ness monster itself. So. when and how did this hypothetical horror come into theoretical being, and why does it persist in casting its nebulous shadow over the much more romantic (if no more realistic?) image of its plesiosaurian rival? It's time to find out! 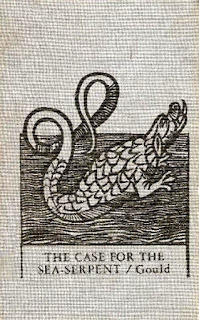 Although in modern times the concept of the long-necked seal as a zoological reality has been promoted most visibly by the cryptozoological triumvirate of Oudemans, Heuvelmans, and Costello, a mysterious creature not only fitting its description but actually referred to by that very same name had been documented as far back as the 1600s, but was completely overlooked by cryptid chroniclers until the 1990s. 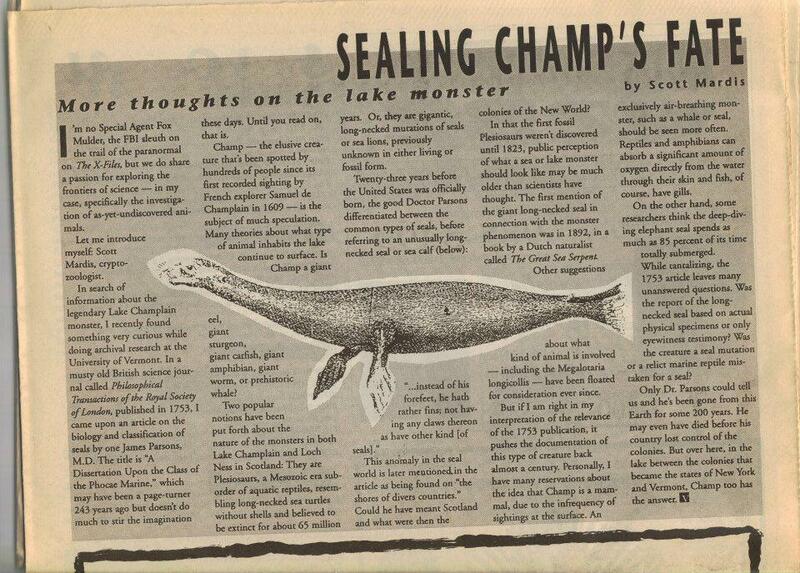 This was when American cryptozoologist Scott Mardis made a highly significant discovery, by spotting its long-forgotten description on microfiche at the University of Vermont, after which he duly brought this surprising but potentially very important beast to present-day public attention at long last via an article published on 7 August 1996 in a Vermont weekly magazine entitled Vox. THE LONG-NECK'D SEAL. I find him no where distinctly mention'd. He is much slenderer than either of the former [two other pinnipeds documented by him earlier – see below]. But that wherein he principally differs, is the length of his Neck. For from his Nose-end to his fore-Feet, and from thence to his Tail, are the same measure. As also in that instead of fore-Feet, he hath rather Finns [sic]; not having any Claws thereon, as have the other kinds. Conversely, in most known species of pinniped the length of their neck is only about half the length of their lower body. He is much slenderer than either of the former; but that, wherein he principally differs, is the length of his neck; for from his nose-end to his fore-feet, and from thence to his tail, are the same measure; as also in that, instead of his fore-feet, he hath rather fins; not having any claws thereon, as have the other kinds. The head and neck of this species are exactly like those of an otter…That before described [the long-necked seal], was 7 feet and an half in length; and, being very young, had scarce any teeth at all. 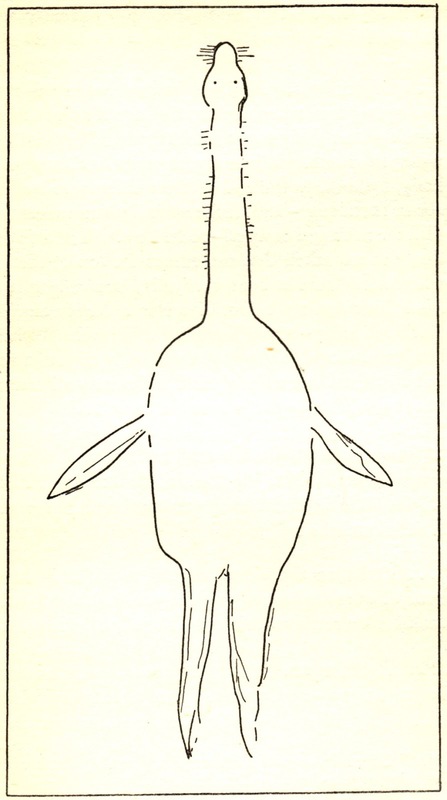 Accompanying its description, moreover, was an illustration of this unidentified creature (reproduced in Scott's Vox article), which portrayed it with a decidedly elongate neck, and was captioned 'the long necked seal or sea-calf'. It was depicted alongside two other seals (the same two as described by Grew prior to the long-necked seal). One of these two was termed 'the common seal' (i.e. Phoca vitulina), and was readily identifiable as this species. The other one, conversely, was more perplexing, being dubbed 'the tortoise-headed seal' (and which must wait for its own review elsewhere!). In his seal listing at the end of his paper, Parsons noted that the long-necked seal could be found "on the shores of divers[e] countries". Be that as it may, no additional skins of long-necked seals have been forthcoming since the time of Grew and Parsons – their specimen thus being unique. So where is this zoologically-priceless skin today – what may well be the only physical evidence of a cryptozoological long-necked seal ever obtained by science? Tragically, no-one knows – like so many other remarkable specimens of mysterious, unidentified creatures, it has seemingly been lost, vanished into that great void where cryptid material seems irresistibly and inexorably drawn, never to be seen again. 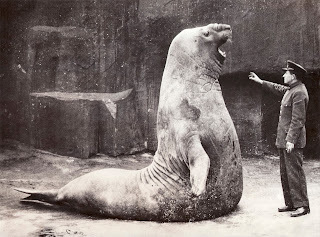 Although, therefore, as revealed above, this was not its earliest appearance in the historical chronicles, the long-necked seal first made cryptozoological headlines during the early 1890s. This was when Dutch zoologist and passionate sea serpent investigator Dr Anthonie C. Oudemans envisaged just such a beast as the answer to one of the greatest riddles in 19th-Century natural history – the elusive identity of the even more elusive 'great sea serpent'. After analysing numerous sea serpent reports originating from seas all around the world and dating back centuries in some cases, Oudemans considered that their most plausible explanation was the scientifically-undiscovered presence of an enormous species of seal, boasting a cosmopolitan distribution, and morphologically distinguished from all presently-known species not only by its huge size (capable of growing up to 200 ft long) and long slender tail (a very unseal-like feature), but, in particular, by its very sizeable, elongate neck (which bore a noticeable mane in the male). 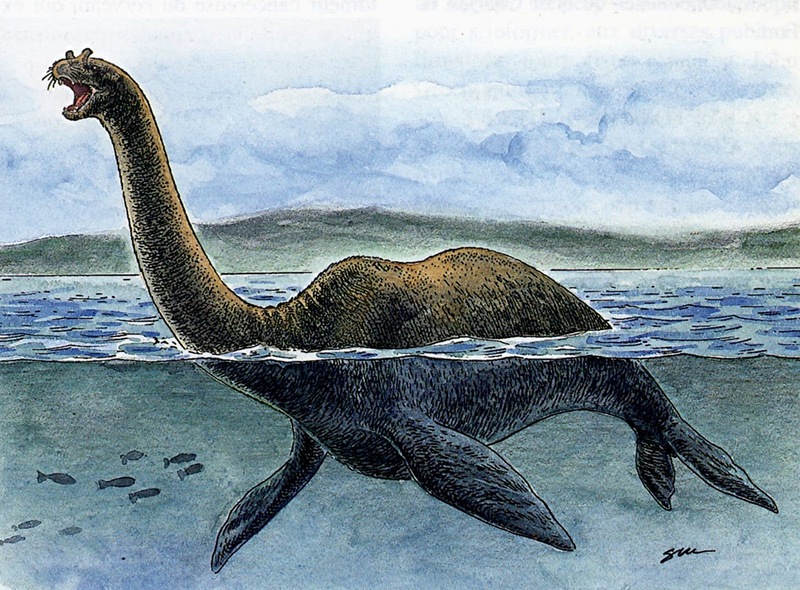 In illustrations depicting its likely appearance in life, it looked very like a mammalian plesiosaur (or a plesiosaurian mammal). Oudemans even gave this seagoing marvel its very own taxonomic binomial – Megophias megophias, thereby classifying it as a new species within a (now-defunct) genus that had been coined back in 1817 by French-American naturalist and passionate sea serpent investigator Constantine Samuel Rafinesque-Schmaltz in his published description of an uncaptured snake-like marine cryptid responsible for a spate of reported sea serpent sightings off Gloucester, New England, at that time (Megophias translates as 'big snake'). 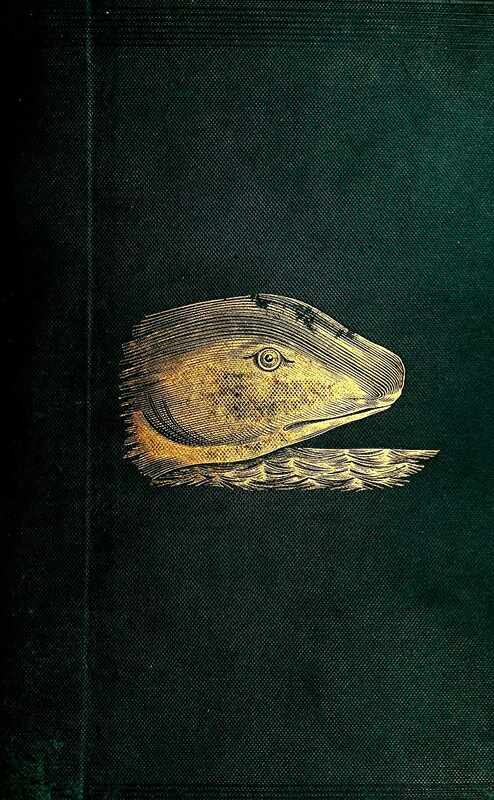 In 1892, Oudemans published his extensive study and conclusions in his now-classic tome The Great Sea-Serpent, which makes fascinating if frustrating reading. For at the risk of perpetuating further this unintentional bout of alliteration, his resolution of the sea serpent problem was fatally flawed. Anyone reading the vast array of sightings documented by him can readily perceive that the beasts observed belong to a variety of discernibly distinct types. Yet Oudemans, inexplicably, chose to shoe-horn them all into one, resulting in his creation of M. megophias as a 'one-size-fits-all' solution that was doomed to failure when attempting to convince mainstream scientists already highly suspicious of sea serpent reality that it was truly the taxonomic alter ego of this incognito maritime enigma. And so, inevitably, Megophias floundered, Oudemans's ill-fated composite creation garnering little in the way of zoological credibility for itself, and rapidly sinking without trace into the gloomy abyss of scientific obscurity instead. And there it would linger, unloved and unlooked-for, all but forgotten for almost three-quarters of a century, until the long-necked seal hypothesis was finally retrieved, revived, and reconstituted in a very different form as part of a much more comprehensive, and complex, sea serpent classification conceived by a certain Belgian cryptozoologist – Dr Bernard Heuvelmans. 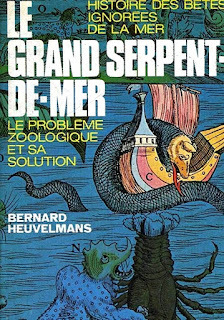 Not only did Heuvelmans share a similar surname with Oudemans, when his own magnum opus on the sea serpent mystery was first published, in 1965 in French, it likewise shared the same name as Oudemans's – Le Grand Serpent-de-Mer ('The Great Sea-Serpent'). (Three years later, somewhat abridged and combined with a greatly-shortened version of an originally separate book on the giant squid and giant octopus, it was published in English as In the Wake of the Sea-Serpents.) And even his postulated long-necked mega-seal had a similar generic name to Oudemans's Megophias – namely, Megalotaria. But that is where the similarities ended. Not making the same mistake as his near-namesake predecessor, in his grand scheme of sea serpent classification Heuvelmans conceived no less than nine distinct categories. Each constituted a different, scientifically-undiscovered species, and which he believed collectively explained all of the major sea serpent sightings reported from around the world down through history. 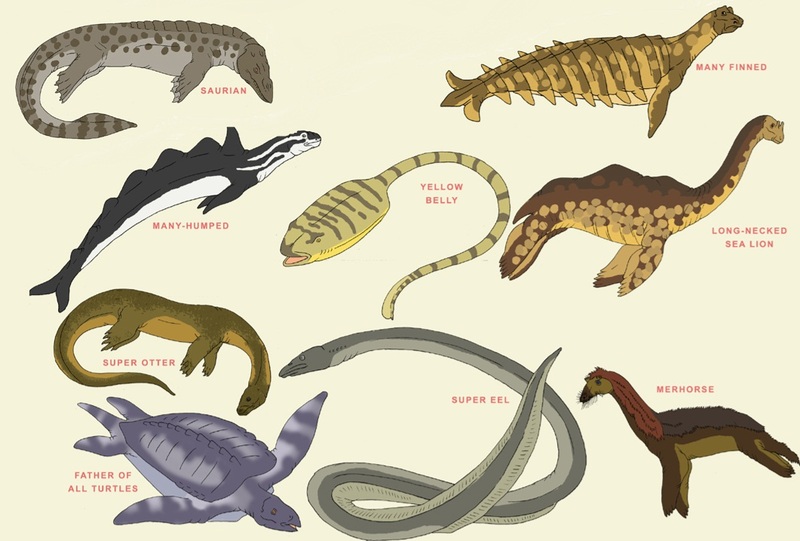 These hypothesised species were: a giant yellow tadpole-like creature of indeterminate taxonomic affinities; a gigantic 'super eel' (and/or a very elongate form of shark); a marine reptile resembling a prehistoric mosasaur or a flippered crocodilian; an immense sea turtle; a many-humped serpentine zeuglodont-like cetacean; an armoured anomaly that he considered to be another zeuglodont due to his mistaken belief that armoured zeuglodonts were known from the fossil record (in reality, these were later exposed to be normal zeuglodonts whose remains had been found in association with armour-like scales derived from other, entirely unrelated fossil creatures); an exceedingly primitive stem cetacean of superficially otter-like form but much greater size and still possessing four limbs (his so-called 'super-otter'); and two separate types of pinniped, both of which were either tailless or near-tailless, like all modern-day species. After more than 70 years in zoological – and cryptozoological – exile, the long-necked seal was back! A sea-animal of fairly large size, much bigger than the biggest pinnpeds and recognizable by its very long slender neck. Its general shape can vary greatly because of its thick layers of fat: sometimes cigar-shaped, sometimes serpentine when swimming fast, it may seem thick and stumpy when hunched up on itself. The relatively small head is round in shape with a somewhat tapering muzzle, sometimes like that of a seal or dog, sometimes like that of a horse, camel or giraffe. This apparent contradiction in testimony is doubtless due to the head lengthening with age, as is the rule among mammals. The neck is long and cylindrical; it is extremely flexible and can bend in any direction, especially in a vertical plane like a swan's. It may also stick perpendicularly out of the water like a telegraph pole. It has no mane, but a sort of collar, perhaps a fold in the skin, behind the head is sometimes mentioned. The body is massive, thick and covered with rolls of fat so that it may, according as it bends, show one, two or three big dorsal humps, the middle of the three being the biggest. It has been suggested that these humps are inflatable air-sacs. This is possible, and the explanation cannot be excluded, but there is no need for any such theory in this case. The spine forms a slight ridge all along its length, this may be due to a hairy crest or be accentuated by one. There does not seem to be much tail: at the very most it is a mere stump. The skin looks smooth when it is wet and shining, but seen from close to it looks wrinkled and rough, like a walrus's or an elephant's. It is very dark brown on top, with black, grey or whitish mottling, while the underneath of the belly is dirty yellow and much lighter. …Apart from one or two extravagant estimates of 200 feet or so, almost all the witnesses give a length between 15 and 65 feet – 60 feet often being given in round figures. There is, it is true, a series of witnesses who give lengths between 65 and 100 feet, and even as much as 120, but they seem to be influenced by the preconceived idea that it is a serpent, a plesiosaur, or even Oudemans's Megophias, and to assume it must have a tail as long as its neck and so extrapolate unjustifiably from the visible part of the body. Speaking of extrapolating unjustifiably: I first read Heuvelmans's book over 30 years ago, and back then it seemed to me to be a work of superlative, near-genius zoological detection, worthy of the peerless if fictitious Sherlock Holmes himself (and indeed, Heuvelmans has actually been referred to as the Sherlock Holmes of zoology). In later years, conversely, as my own knowledge of cryptozoology, its methods, and its shortcomings increased, I re-read the book several times, and on each occasion with increasing scepticism regarding Heuvelmans's bold claims and intricate deductions. Even taking into account the fact that he rejected many eyewitness reports as implausible, I personally feel that he nonetheless placed far too much emphasis upon the literal content of those that he did accept, i.e. he drew in-depth, often excessive, conclusions from the descriptions contained in those latter reports that, in my view, cannot be justified, because we simply have no idea just how accurate those descriptions really were. From my own experiences of eyewitness accounts, I am well aware of the all-too-human failure of observers lacking a detailed knowledge of animals to describe with any notable degree of zoological accuracy the physical appearance of creatures that were unfamiliar to them (especially if doing so entirely from memory, and/or from a time some distance removed from the actual event and/or if they had encountered the creatures unexpectedly). This also applies to size estimates proffered by them. Such failure is surely responsible in no small way for the not-inconsiderable variations in eyewitness descriptions noted by Heuvelmans in his extensive and inordinately-detailed Megalotaria identikit account quoted by me above (and which is precisely why I reproduced it verbatim), most notably regarding the shape of its head, rather than (as he evidently if rashly believed) such variations being explicable entirely via anatomical or age-related phenomena. In short, I believe that Heuvelmans placed far too much reliance upon the literal accuracy of eyewitness reports and far too little upon the likelihood that much of what was described in them were artefacts arising from poor zoological knowledge, inaccurate description, and flawed recollection. In addition, following a close examination of Heuvelmans's sea serpent researches and his resulting nine-category classification system, German cryptozoologist Ulrich Magin argued in an extensive Fortean Studies paper from 1996 that far from being the outcome of an objective data analysis, Heuvelmans's sea serpent categories are subjective and predetermined, and that they don't actually function successfully when applied to individual cases. 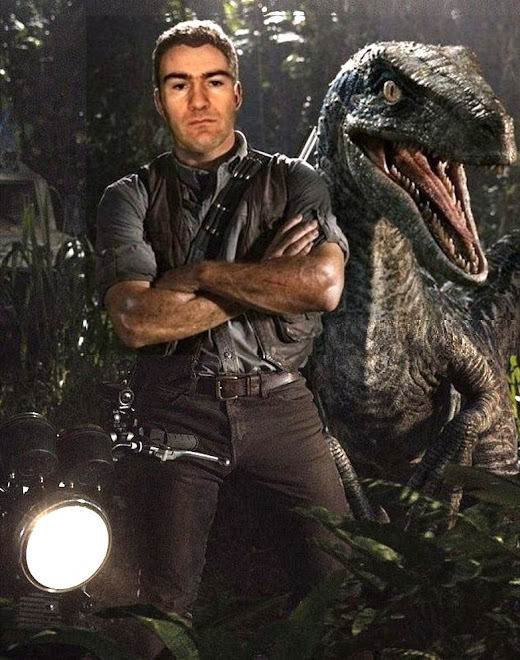 Magin's opinion is shared by British palaeontologist and cryptozoological author Dr Darren Naish, as expressed in a Fortean Studies paper of his own, from 2001. Ideally, to avoid any subjectivity creeping into the data analysis when attempting to distinguish morphological categories of sea serpent present in the data, the analyser should be doing so blind, i.e. using eyewitness descriptions alone as the basis for creating sea serpent categories, not taking into account geographical localities or any other factors like Heuvelmans did. However, the analyser would then be vulnerable to falling foul of the uncertainty that invariably surrounds the accuracy of anecdotal evidence. 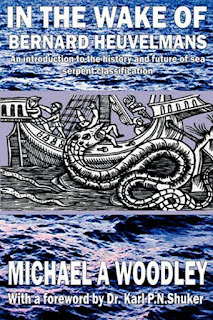 For the most comprehensive examination and assessment of Heuvelmans's sea serpent classification, see Dr Michael A. Woodley's book In the Wake of Bernard Heuvelmans (2008). …is certainly the only sea-serpent that is amphibious. It is extremely flexible. The chief component of its movements is in the vertical plane; and this is mainly seen in its head swinging backwards and forwards when raised out of the water. This is also striking when the animal bounds on land, rhythmically gathering its hind legs up near its front ones and then leaping forward with the front ones, as the sea-lions do. Observers are often struck by the animal's staggering speed, which is quite exceptional at sea. Prodigious speeds, like that of an express train are mentioned, but more trustworthy witnesses, with more knowledge of the sea, generally give speeds between 15 and 35 knots. Such speeds seem to imply that it is a predator feeding on very fast-swimming fish. To catch its prey, the long-necked sea-serpent must make use of its long flexible neck to dart its jaws suddenly well ahead of its body. No breath is ever visible. When the animal appears on the surface it sometimes leaves a greasy wake on the sea, as pinnipeds likewise do. It is evidently like a sort of huge gressigrade [i.e. otariid] pinniped with a very long neck, and more specialized than the sea-lions for a purely marine existence. It is true that this usually pelagic animal is still able to move on land, but it seems unlikely that it is obliged to go there to give birth: parturition must be able to take place at sea, a considerable advance over the sea-lions. In addition to my above concerns regarding how literally he took eyewitness description, I also have some rather more specific criticisms of Heuvelmans's giant long-necked seal as the identity of the longneck sea serpent. For a creature as huge as Megalotaria yet only possessing tiny eyes, poor eyesight, and vibrissae present only in juveniles, utilising sonar for hunting its prey would not be an unreasonable prediction (as long as we remember that these above-cited characteristics are based entirely upon anecdotal, not physical, evidence). However, it is rendered far less plausible by the stark fact that even today, a full half-century after Heuvelmans wrote those above-quoted lines concerning this possibility, there is still no consensus that pinnipeds actually do employ sonar in hunting prey; over the years, this intriguing possibility has attracted many claims and counterclaims, but no conclusive evidence has been forthcoming. Nor has any for the possession of snorkel-like breathing tubes arising round the nostrils in any known pinniped species; so although such structures might indeed explain eyewitness reports of supposed horns, they would nevertheless be a notable evolutionary novelty. The single most striking feature of Megalotaria, the one that earns for it its common name, is its exceedingly long neck. According to Heuvelmans, this neck "is extremely flexible and can bend in any direction, especially in a vertical plane like a swan's". One wonders, however, exactly how flexible did he mean by "extremely flexible", in view of the fact that as a mammal Megalotaria is exceedingly likely to have possessed only seven cervical vertebrae. It is the rotational and pivotal capacity of a vertical bony prong arising upwards from the axis (the second cervical vertebra) called the dens, which protrudes up through the ring-shaped atlas (the highly-specialised first cervical vertebra), yielding the atlanto-occipital joint, that enables the mammalian head (attached directly to the atlas) to turn through a considerable angle horizontally, and also to nod up and down. But what about the rest of the neck? Assuming that it does contain only seven vertebrae, how feasible are Heuvelmans's claims about the extreme, swan-like flexibility of the neck of Megalotaria? One might expect from the vertebrae alone that through much of its length, it would be as inflexible as a stiff rod, but neck flexibility in mammals is mediated to a considerable extent by the intervertebral cartilage discs and caps, so Megalotaria's neck may well be more flexible than might otherwise be assumed. Also of note is that the giraffe's very long cervical vertebrae are connected to one another via ball-and-socket joints, thereby affording each section of the neck a remarkable degree of flexibility for such an exceptionally elongated structure yet composed of only a small number of very long internal prop-like structures. Might Megalotaria possess a comparable cervical arrangement? If so, however, this would be yet another major evolutionary novelty unparalleled among other pinnipeds. Equally problematic is Heuvelmans's proposal that Megalotaria is a pelagic otariid that gives birth at sea, bearing in mind that otariids are in fact the most terrestrial of all pinnipeds, much more so than phocids or earless seals. For unlike phocids, the otariids can turn their hind limbs forward and are therefore able to walk on land. Also, they all breed on land, they come ashore more often than phocids (especially when moulting their fur), and often the adult males each maintain a harem of females on land (polygyny). Consequently, otariids are the least likely seals to have yielded a species exhibiting the predominately sea-living lifestyle that he envisaged for Megalotaria. Also, it is the phocids, not the otariids, that have also produced the biggest known modern-day pinnipeds – the two species of elephant seal Mirounga spp (which are even bigger than the walruses). And Heuvelmans's assertion that Megalotaria "bounds on land, rhythmically gathering its hind legs up near its front ones and then leaping forward with the front ones, as the sea-lions do", which does recall the terrestrial locomotion of otariids rather than phocids, was actually based upon just a single eyewitness account, so it is hardly a well-attested characteristic. Overall, therefore, it is more likely that if Megalotaria does exist, it is a phocid, not an otariid (Megaphoca, anyone?). 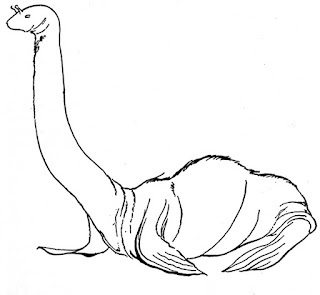 Heuvelmans discounted the possibility that the longneck sea serpent sports anything but the shortest of tails – if, indeed, it possesses one at all. This clearly corresponds with a pinniped identity (a major problem with Oudemans's Megophias as any kind of seal was its very lengthy tail, because modern-day pinnipeds are conspicuously bereft of such a sizeable appendage). Yet he seemingly chose to ignore those eyewitness accounts that described longnecks with long tails. True, some such tails may have been artefacts, i.e. merely wakes or trails of bubbles, but others seemed genuine structures. Heuvelmans concluded his coverage of Megalotaria by stating that apart from polar waters it exhibited a cosmopolitan distribution (an assertion drawn from the geographical distribution of eyewitness reports), generally sighted near the coast in cold temperate regions and in mid-ocean in warm temperate zones. Based upon more detailed analysis of the geographical spread of sightings plotted against the time of year when they have occurred, Heuvelmans further concluded that Megalotaria prefers spending the spring and warm season in northern cold temperate regions, migrating to the tropics to spend the end of the summer and the autumn there, before moving even further south into the southern hemisphere's temperate zone to spend the end of this latter hemisphere's summer there, thus avoiding entirely the cold extreme of the northern winter. However, the reality of a highly mobile (and hence more readily encountered?) species of seal that is also "much bigger than the biggest pinnipeds" and occurs globally is one that I find difficult to accept. After all, the biggest pinniped currently known to exist today, the mighty southern elephant seal Mirounga leonina, already measures up to 22.5 ft long and can weigh over 10,000 lb – dimensions that are hardly inconsiderable. Yet if Heuvelmans is to be believed, this latter pinniped is positively dwarfed by a truly colossal species that is three times its size, and whose long-necked morphology sets it even further apart from all other pinnipeds, but which, incredibly, is still unrepresented by a single specimen. Not even so much as a beached skull or skeleton portion appears ever to have been discovered and retrieved on any coast anywhere in the world, despite Heuvelmans's assertion that the longneck is of cosmopolitan distribution, and whereas occasional remains even of exceedingly little-known and quite possibly uncommon species of beaked whale and other very large, exclusively maritime mammals have indeed been found washed ashore. In 2007, an extensive 117-page article written by cryptozoological enthusiast Robert Cornes that supported the possibility of the longneck sea serpent and its freshwater counterpart constituting some form of undiscovered long-necked pinniped was published in that year's CFZ Yearbook, and included a number of thought-provoking speculations. One of these was that perhaps this surreal seal does come ashore to breed (rather than doing so at sea, as proposed by Heuvelmans) but remains unseen while on land by breeding in remote, inaccessible caves. Bearing in mind that seals breeding on land is generally not only a very visual affair but also a very noisy one, it would surely require a highly secluded location indeed for Megalotaria to breed while remaining out of earshot. Another speculation concerned whether the lengthy neck may assist in thermoregulation, in a manner reminiscent of one confirmed with seal flippers – in which warm blood can be diverted into these limbs, after which they are waved in the air to assist the animal in cooling off. Also in 2007, sea serpent researcher Bruce A. Champagne published a comprehensive article entitled 'A classification system for large, unidentified marine animals based on the examinations of reported observations' within the multi-contributor tome Elementum Bestia (edited by American cryptozoologist Craig Heinselman). Like Heuvelmans, Champagne differentiated nine different sea serpent types, but they did not all correspond with Heuvelmans's; moreover, he also subdivided some of these types to yield several subtypes. One of Champagne's nine types was the longneck, which he then split into two subtypes, distinguished primarily via the size of the head in relation to the neck diameter. 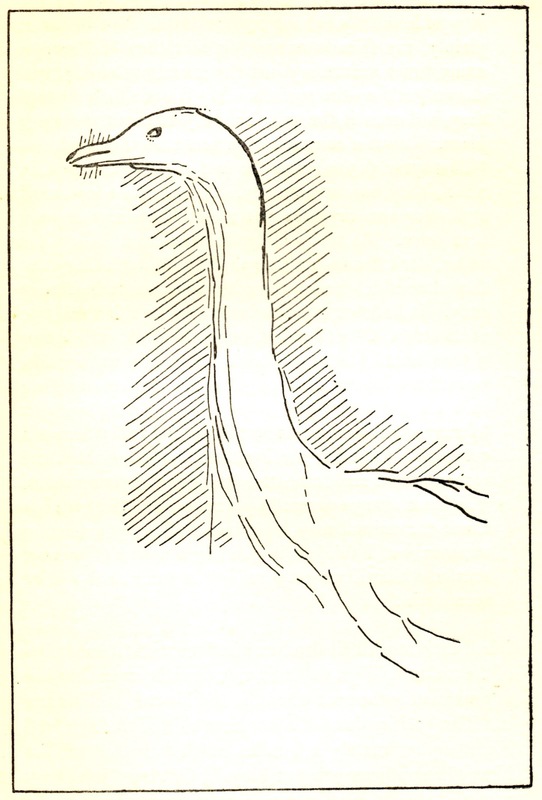 Most longneck sightings were assigned by him to the first subtype, in which the head's diameter was the same as or slightly smaller than that of the neck. In addition, and going totally against Heuvelmans's opinion, Champagne proposed that this longneck subtype sported a long tail (thereby hearkening back to Oudemans and Megophias). The second subtype, in which the head's diameter was larger than the neck's, consisted of five sightings from the North Atlantic off Great Britain and Denmark, and all five of these featured robust animals that, according to the eyewitnesses, were over 55 ft long, and therefore much bigger than those longnecks constituting the first subtype, which did not exceed 30 ft at most. To me, the longneck sea serpent is an enigma – a cryptid that I want so much to exist, as it would solve so many cryptozoological riddles – and not just marine ones either, as I'll be discussing in Part 2 of this ShukerNature blog article (click here) – but which, at least in the guise of Megalotaria as envisaged by Heuvelmans, seems beset by serious shortcomings.